We are constantly expanding our range of antibodies and reagents, resources and online tools to help you choose the right antibody, design experiments and achieve more. Therapeutic antibodies are a major strategy in many different types of therapy, for instance the treatment of cancer, inflammation and infectious diseases. Antibodies can be used to neutralize pathogens and toxins, tag cells for complement or cell mediated lysis, and alter cytoplasmic cascades. One of the main reasons antibody therapy is so versatile is because antibodies are able to bind to specific target cells. However, potential problems with antibody therapy are immunogenicity, stability, tissue penetration and accessibility of the targeted binding site. The latter two being largely due to their physical size. Antibody engineering has enabled the development of antibody fragments that have the same targeted specificity, but a smaller size, resolving problems with tissue penetration and target access. However, compared to full size antibodies, these fragments have a significantly reduced half-life. To overcome this, antibody fragments containing immunoglobulin (Ig) G Fc constant heavy chain 2 (CH2) regions have been developed. The CH2 in Ig classes IgG, IgA and IgD and the constant heavy chain 3 (CH3) in Ig classes IgE and IgM, form the Fc region of an antibody. 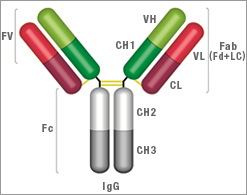 Please refer to the IgG antibody image below to visualize where these regions are located on an antibody. The CH2 and CH3 regions within the Fc region are critical for Ig effector functions to elicit an immune response. The stability conferred by the IgG Fc CH2 fragment is a result of the binding of the neonatal Fc receptor (FcRn) to CH2, contributing to the long half-life of the Ig. FcRns natural function is in the stabilization of IgG as it transitions through the placenta to the fetus, prolonging the half-life of cellular IgG antibodies after birth. Click here for further information on IgG and the antibodies available to this Ig class. The development of antibody fragment libraries capable of binding multiple epitopes, has led to advances in antibody engineering and adaptation of the modular structure of antibodies, securing the future of antibody therapy. The use of secondary antibodies to CH2 and CH3 domains enables Fc fragments to be studied, aiding the development of new therapeutic antibody fragments. Antibodies are available with a selection of chromogenic and fluorescent labels and suitable for many applications including ELISA, western blotting, immunohistochemistry, immunofluorescence and flow cytometry. Each is performance guaranteed for the application listed on the product datasheet.